First of all, some remarks concerning the survey I mentioned last week. Despite taking certain precautions to try to be as rigorous as possible, I am well aware that my study has no real scientific value. In fact, the population sampled is not only too small, but also not representative at all. The number of individuals working in the music world is certainly much more significant. On the other hand, it's also important to consider that in able to find 200 persons willing to partake in this study I had to resort to my extended circle of acquaintances. In other words, two thirds of the participants were men between 20 and 25 years old with a two-year Higher Education diploma living around Montpellier, which as you can imagine is far from being representative of "music consumers" in general. Not to mention other factors like the choice of "test" songs, their tempo, etc., which also influence the responses. According to the numbers I provided last week, the best thing would be to have a tailored mix for everyone, which is obviously impossible because you never know who's going to be listening to what song, when and whether he/she is a lefty or driving a car. And let's not forget that more than a quarter of them don't have any preference or can't even identify correctly the object of the study. Consequently, I think the question of whether you should place the drums in the stereo field respecting the point of view of the audience or the drummer's is a hollow debate and there is no one-size-fits-all answer. For a song that has a "live" sense to it or whenever I want the drum kit to sound large and/or deep, I adopt the point of view of the audience. 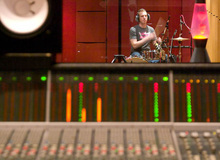 For a more intimate track or one that suggests an "internal desire" I choose the point of view of the drummer. But I obviously take into consideration the spectral density of the entire stereo mix and make my decision according to the needs of the song in this regard, even if it goes against the two "rules" I just mentioned above. When I work on different songs of the same album this choice helps me to reinforce the sensation of cohesion of the album, always sticking to the same point of view regarding the drums. On the contrary, adopting a different point of view helps me emphasize a "rupture" whenever needed. And sometimes I decide to not even pose the question and go for a mono mix, for "vintage" sounding productions, for instance, but not only. That's my method, for what it's worth. Although I can say that nobody has ever complained to me about the point of view of the drums in any of my mixes. So in the end I guess you need to take the decision depending on what you think serves the song better, which will make your life easier. After all, the result will not please everybody, but I also know that many people don't give a damn about it, so why rack your brains with the issue? To finish, I'll also add that I approach the "issue" of the stereo width of the drum kit in a similar way: as long as what I'm doing works for the song in question, I couldn't care less about any rules. See you next week for some new adventures in recording!